In the background is the Powder Tower built in 1496 by King Vladislav II as a cannon bastion overlooking the Stag Moat. The original tower was destroyed by fire in 1541, but was rebuilt as the home and workshop of gunsmith and bell founder Tomas Jaros who made Prague's largest bell. In 1576, during the reign of Rudolph II, the tower became a laboratory for alchemists such as Edward Kelly. 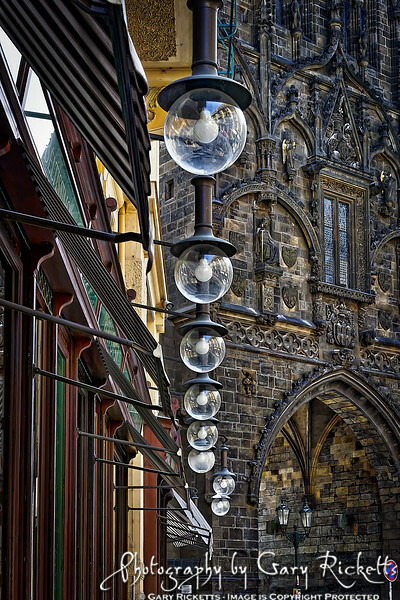 In 1754 it was converted into apartments for the sacristans of St. Vitus's Cathedral. Today it is a tourist attraction, housing a museum to its earlier activities.